Any validly married Catholic couple can become members of CFC. Although a Catholic movement/organization, CFC remains open to having non-Catholic Christians as members. Those who want to join CFC will have to go through a Christian Life Program (CLP). 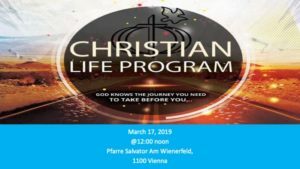 What is Christian Life Program? The Christian Life Program or CLP is an integrated course intended to lead the couple into a renewed understanding of God’s call to them as Christians. It runs for a total of 13 separate sessions, held once a week. At the end of the seminar, couple-participants are invited to dedicate themselves to the Lord as CFC members and to commit to participate actively in the life of the community and of the Church through regular prayer meetings, attendance in community assemblies and teachings, participation in parish life. What should I do if I am interested to attend the Christian Life Program (CLP)? If you are interested on joining a CLP and later CFC, you may ask any CFC member that you know or you may check from list of CLP schedules below and get in touch with the contact person that is listed.